In the heart of Kinston’s former Banker’s Corner, The O’Neil is a portrait of tradition in eastern North Carolina. Its’ story mirrors Kinston’s historic rise, and current rebirth, as a hub of commerce and culture in our great state. 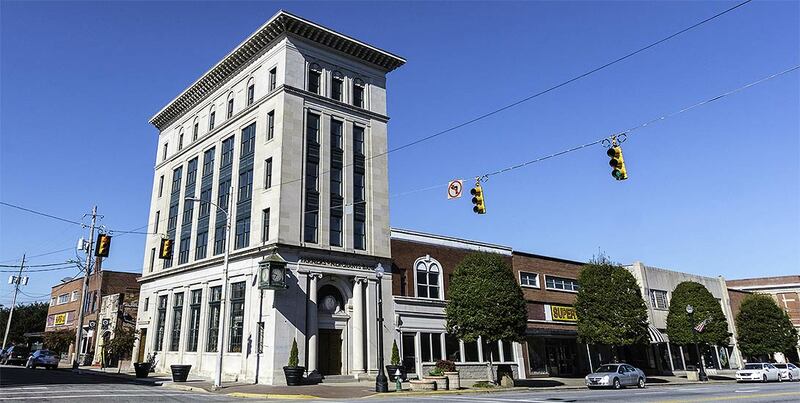 Based on the Renaissance Revival style that was popular in the early 1900s, The O’Neil building, originally a Farmers & Merchants Bank, was designed by the architectural firm Benton & Benton of Wilson, NC. Work on the building began in 1919 and was completed in 1924. Located on the corner of Queen and Gordon streets across from the former National Bank of Kinston, the structures became the center of Lenoir County’s booming agricultural economy. The O’Neil’s grand and imposing style helped usher in Kinston’s transition from a rural farming community to a bustling city at the turn of century. Today, The O’Neil’s facade is indicative of the City Beautiful Movement that was popular in the 1920s and places the building on the National Register of Historic Places. The outside of the building is composed of limestone, overhanging bracketed eaves and arcaded top floor windows. The polished steel staircases in the front and the rear of the building frame the inside of the original structure. The centerpiece of the two-story open lobby is the 16-ton vault that is housed on the first floor of the building, setting the floor plan for the main lobby. The building has four vaults in all. 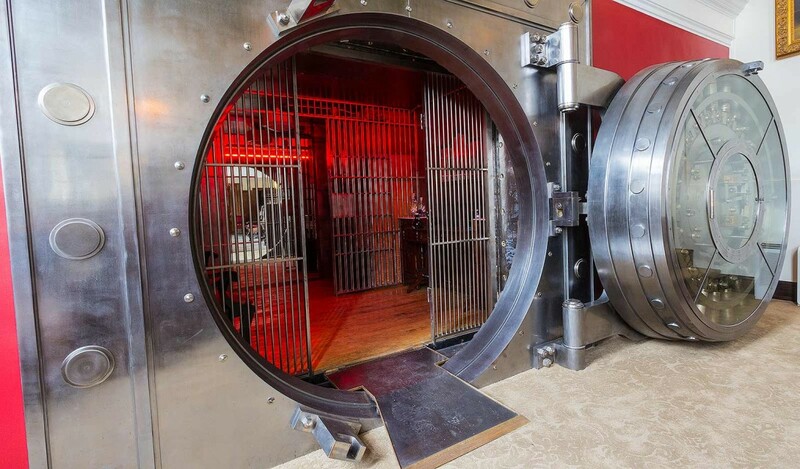 The main vault, which is still operational, can be moved and closed by a single operator. The lobby also contains a marvelous plaster ceiling that has been refurbished to highlight its attention to detail. It is one of the finest examples of an ornate plaster ceiling in North Carolina. Teller windows and marble counters have been preserved and converted to lush sitting areas, where guests can still see the old alarm mechanisms underneath their seats while relaxing among the many antiques surrounding the lobby. Each floor took a year to build and housed many of the bank’s internal offices. The first registered elevator in the state of North Carolina is in the building. It has since been remodeled to meet modern standards. After the completion in 1924, the original Farmers & Merchants Bank was forced out of business by the Great Depression. Eventually the building would be housed both by BB&T and First Citizens Bank respectively. 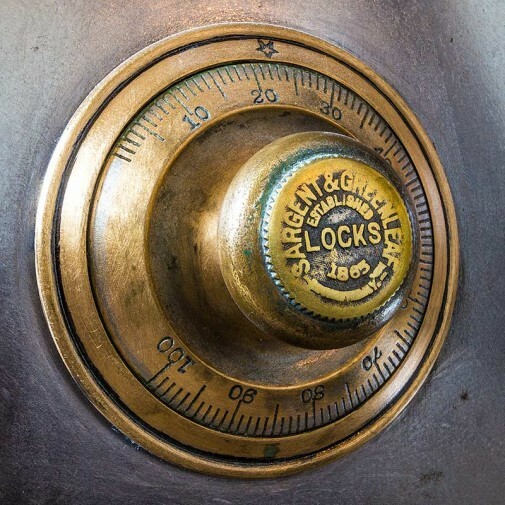 In the 1980s the bank doors were closed and the vault closed for the last time. The building then lay dormant until the ongoing revitalization efforts of Stephen Hill. Through his vision this historic structure has become the forefront of Kinston’s downtown rebirth. Today, the hotel gets its name from Stephen’s father, Robert O’Neil Hill, who was a leader in the Kinston business community. He continues to be a great influence on Stephen’s restoration and revitalization efforts. Robert passed away in 2000 and the building is named in his memory. The O’Neil will be a monument of culture and growth in this beautiful eastern North Carolina community for years to come. It will maintain its legacy to the traditions of the beautiful city of Kinston.